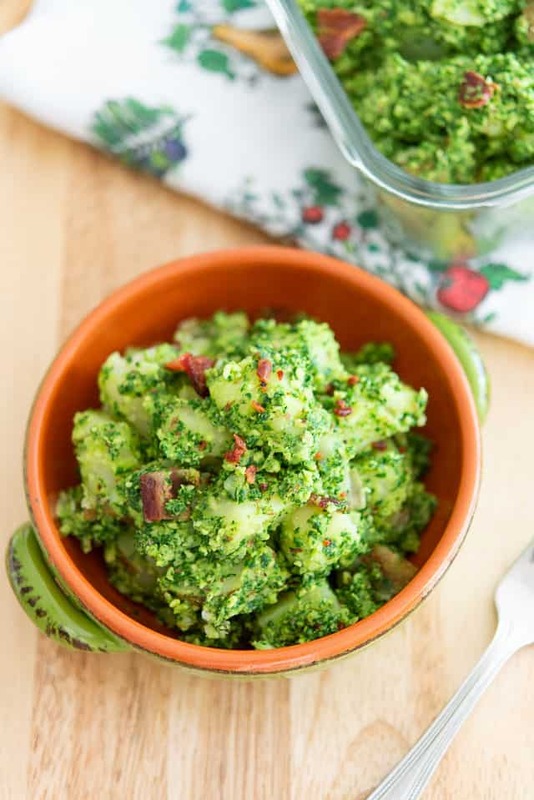 Warm Potato Salad - Potato Salad Without Mayo Has Kale Pesto Instead! 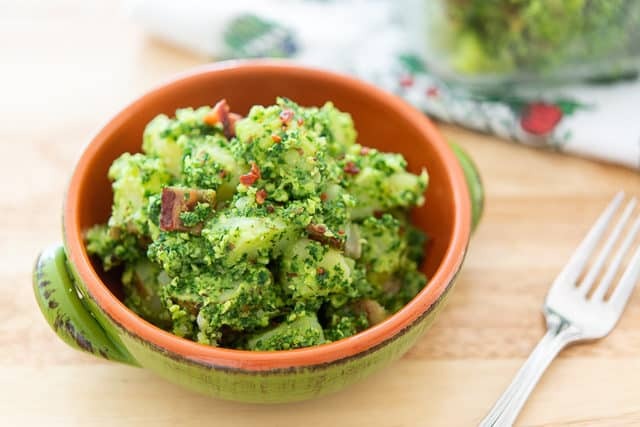 This mayo-free Warm Potato Salad is tossed with a flavorful kale pesto and bacon for a unique side dish! Though I have a place in my heart for a classic cold Potato Salad, potatoes have a much better texture when they’re served warm. They retain their fluffy, soft texture and don’t get the mealiness that often happens when you chill potatoes. While you can certainly prepare a mayo-based potato salad warm, warm mayonnaise dressing is not my favorite. It’s the perfect time to go with another type of dressing! 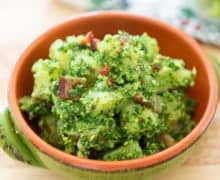 This Kale Pesto is absolutely wonderful with the potatoes, and it’s healthy, hearty, and suitable to different types of diets. And bacon always helps, with all the flavor it adds. Let’s get cooking! You may also use red or yukon gold potatoes, if you wish. While the potatoes cook, it’s time to make the pesto. 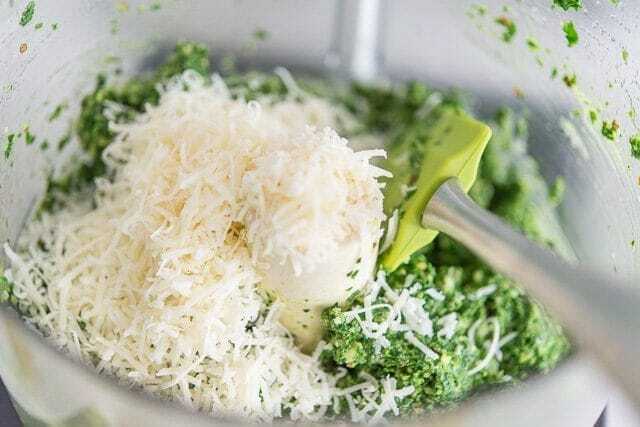 This ensures that the potatoes absorb the flavors of the pesto. It really does tie it together in an essential way. Here’s a post on How to Cook Bacon in the Oven, which is my preferred method for making big batches of bacon for recipes like this. 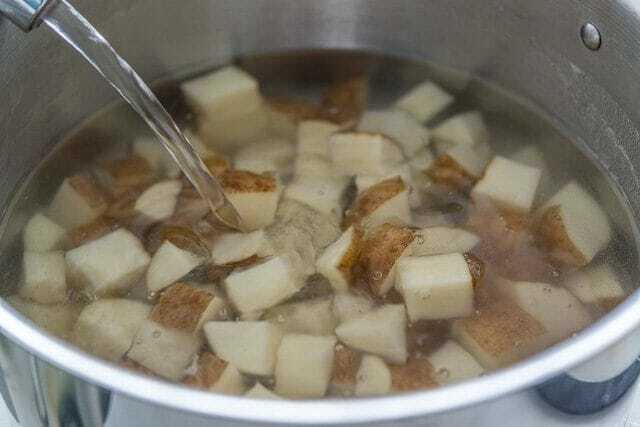 Place the potatoes in a large pot and cover with cold water. Add a couple large pinches of salt, place over high heat to bring the water to a boil, then reduce to a simmer. 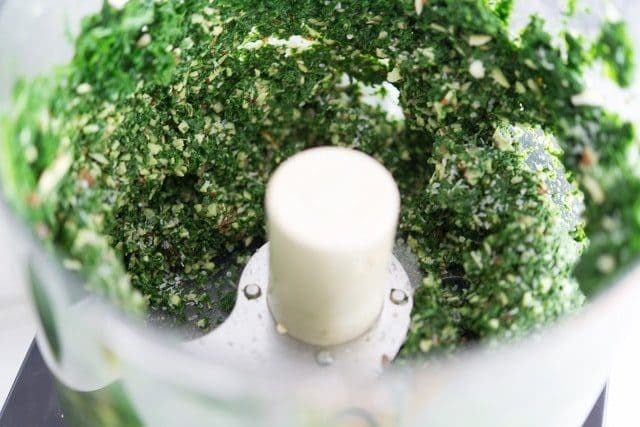 In the meantime, make the kale pesto. 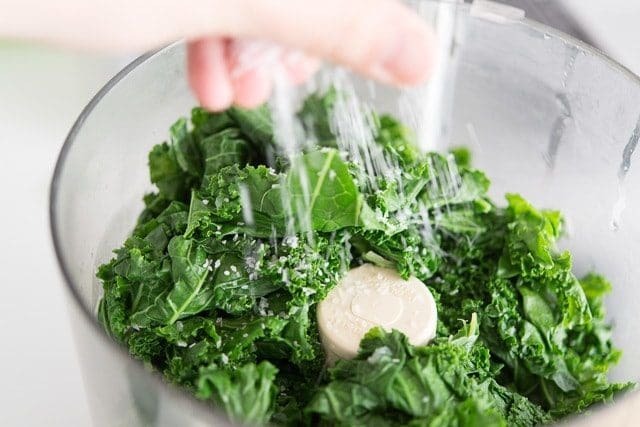 Place the kale leaves in a food processor, and add a big pinch of salt. 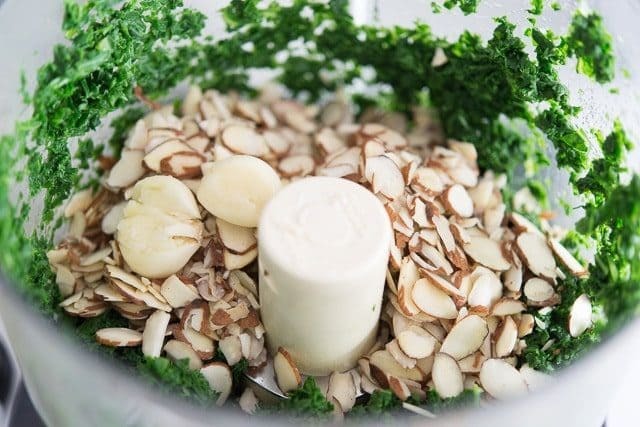 Process until finely chopped, then add the almonds and garlic. 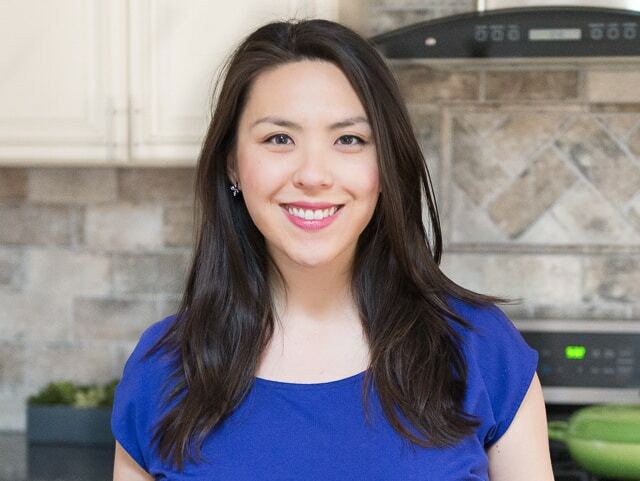 Process until finely chopped. With the machine running, add the olive oil, and mix until incorporated. Finally, pulse in the parmesan cheese. Taste the kale pesto and make any necessary seasoning adjustments. Once the potatoes are fork tender, drain in a colander. 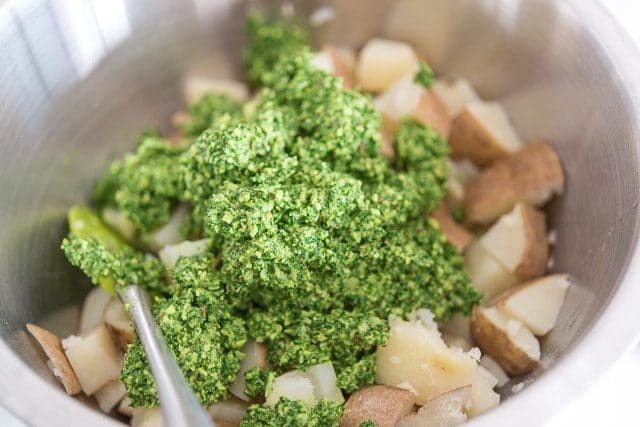 Immediately dress the warm potatoes with the kale pesto, and toss in the crumbled bacon. Serve warm. Enjoy! *I blanch the kale leaves in boiling water for 45-60 seconds, until bright green. This takes the bitterness away and also ensures a bright color. 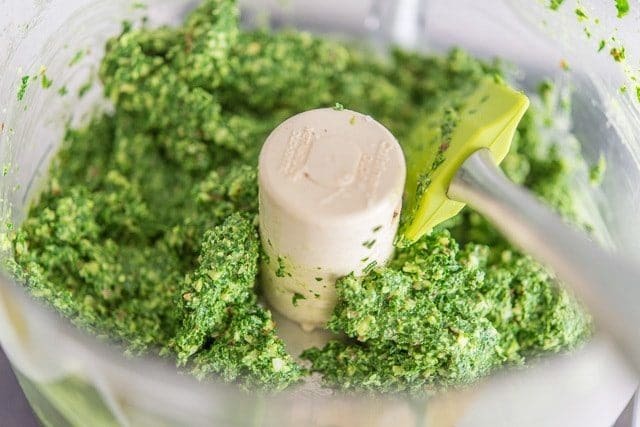 ** Add 1/2 cup of oil for a more traditional pesto consistency. Post updated in April 2019. Originally published November 2014. I’ll definitely have to try this! My boyfriend and I were actually talking about how we dislike cold potato salad recently. But warm potatoes with pesto and bacon? Sounds amazing! What a great way to use Kale! Looks delicious…..never had warm potato salad, but willing to try this one…. Everything with bacon is better! 🙂 thanks for sharing!